In my latest research for Fab-u-less fall fashion I have to point out how many upscale designers are now making lines we can all afford. Anna Sui at Target (see In The Closet -Day 34 ). BCBG's Max Azria teaming up with Miley Cyrus for a line of rocker cool basics, (and they are not just for teens), and Norma Kamali, both at Walmart! Lauren Conrad and of course Vera Wang at Kohls. And the list goes on. 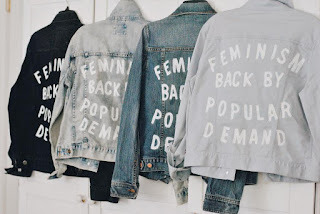 The words fashionista, bargainista, recessionista are getting worn out! Can anyone just say CHEAP? And here's one that threw even me, Kmart! Now I'm all about the Bargain, but there are some places I just don't think of when I think clothes, and Kmart is one of them. 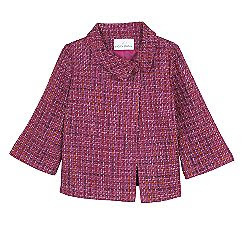 But I saw an ad for this great tweed pink suite and it turned out to be Jaclyn Smith for Kmart. Well, this required a field trip as I had to know if it looked this good up close and personal and what do you know, it did! Check out her other great mix and match pieces as well.